Dhanawat J*, Uppal M**, Samant PY***. We present a rare case of Stickler's Syndrome (hereditary progressive arthro-ophthalmopathy) which is a genetic disorder affecting collagen, comprising of ocular pathologies, hearing disabilities, facial deformity and skeletal dysplasias. 32 year old female with second degree consanguineous marriage, G2 P1 L1 was registered for antenatal care. She had megalocornea and retrognathia but had no complaints of vision or hearing loss; there was no bone deformity. She gave no positive family history of micrognathia, joint problems, vision or hearing problems. Her antenatal period was uneventful. Figure 1. Retrognathia, lateral view. Figure 2. Retrognathia, frontal view. She had a full-term normal vaginal delivery of the first child, and no abnormality was detected in that child. Child is alive and well. 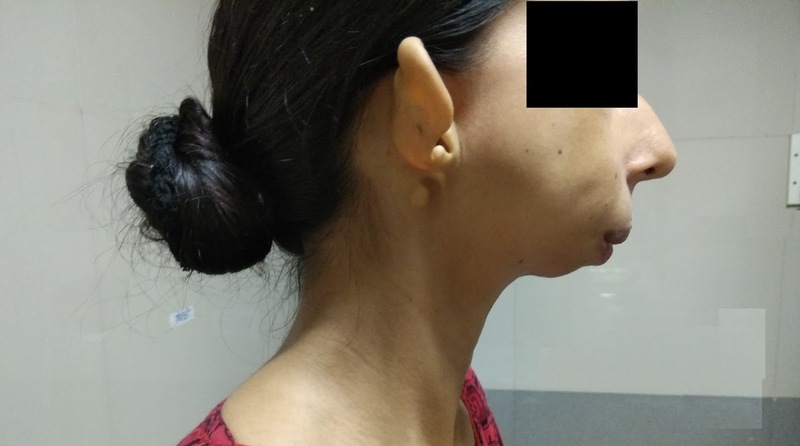 During her antenatal visits, the patient was advised anesthesia and otorhinolaryngological consultation for any anesthetic need intrapartum, but the patient did not consult the specialists. At full term , she underwent lower segment cesarean section in view of breech presentation in active labour. Regional anesthesia was induced, but in case of possible failure, otorhinolaryngologist was kept stand by for SOS tracheostomy. She delivered a male child of 2.1 kg with Apgar score of 9/10 at 1 and 5 minutes. Maternal recovery from anesthesia was uneventful. Mother noticed hyperextensibility of both the knee joints of the baby, with inability to flex both his knees. 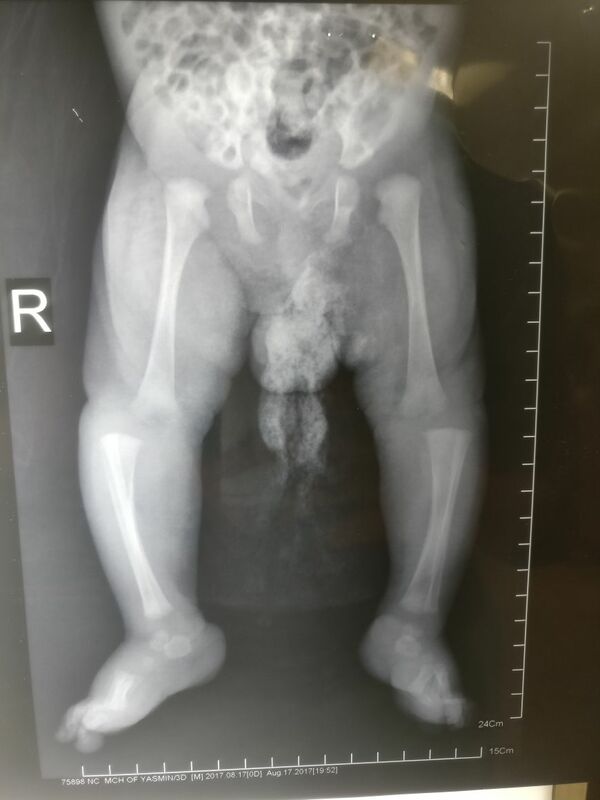 On examination by orthopedic surgeon, the neonate was found to have bilateral hip dislocation with bilateral knee joint dislocation. Figure 3. Congenital dislocation of hip and knee joints. For knee stabilization, slab with bandage has been applied, and serial casting of both the legs with use of hip spica cast to abduct the hip joint has been planned by the orthopedician. Baby had no trouble feeding or breathing. Baby’s face appeared normal. A clinical diagnosis of Stickler’s syndrome was made. Genetic studies were offered to the parents but they declined due to high cost. Ocular examination and examination for sensorineural hearing loss will be done after discharge. Stickler's syndrome is a genetic disorder. It affects connective tissue, specifically collagen type II and IX. It was first described by Gunnar B. Stickler. It can be both autosomal dominant as well as recessive and has varied expressions, from subtle to severe. It affects 1 in 7500 to 9000 new borns. There is no racial predilection. This syndrome resembles Pierre Robin sequence where there is a combination of cleft palate, retrognathia and micrognathia and presents with neonatal respiratory problems. 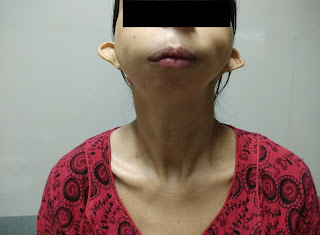 Characteristic of this syndrome is flattened facial appearance due to underdeveloped facial bones. Some children have cleft palate, bifid uvula and high arched palate. One of the first ophthalmic signs of Stickler Syndrome may be myopia. Other ocular abnormalities are vitreoretinal degeneration, cataracts, retinal holes and detachments. Some of these individuals have sensorineural hearing loss. Musculosketelal problems include joint laxity, spinal problems like scoliosis, chest deformities, hip disorder (Legg-Calve-Perthe’s disorder), osteoarthritis. Mitral valve prolapse is also seen. Children affected with Stickler syndrome have normal intelligence but may have learning difficullties due vision and hearing problems. Treatment of affected individuals is based on their specific presentations. It needs coordinated management by geneticist, pediatrician, ophthalmologist, orthopaedic surgeon, rheumatologist, otolaryngologist and internist for complete management. Physiotherapy and various surgeries for affected bones form an integral part of management. Diagnosis of Stickler syndrome may be missed or diagnosed late. Early detection is important so that retinal problems and skeletal deformities are treated at the earliest with minimum complications. Family members’ screening is important for future births in the family. Genetic counseling should be offered to these families. Stickler GB, Belau PG, Farrell FJ, Jones JD, Pugh DG, Steinberg AG, et al. Hereditary progressive arthro-ophthalmopathy. Mayo Clin Proc. 1965; 40:433-55. 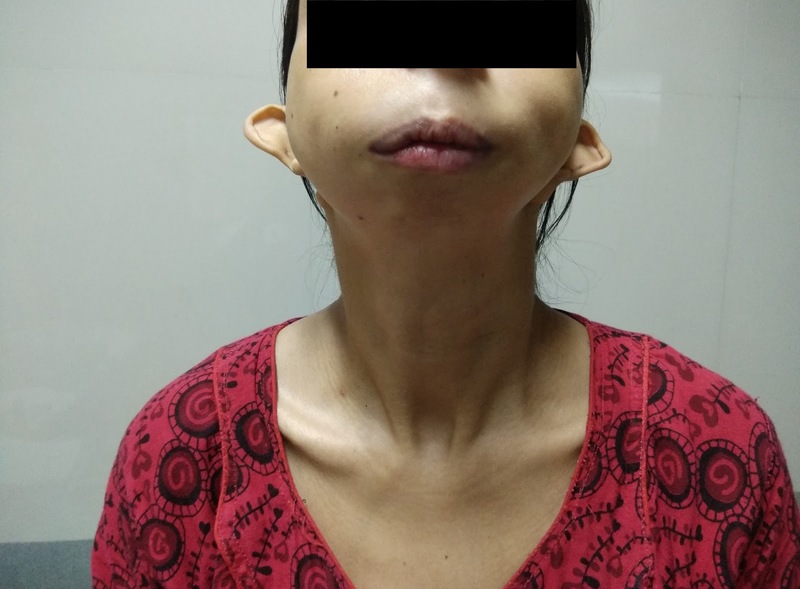 Datta S, De S, Prasad A, Mondal U, Majumdar R. A case of Stickler syndrome with neonatal-onset arthropathy. IOSR Journal of Dental and Medical Sciences 2013; 10(1):1-4. Couchouron T, Masson C. Early-onset progressive osteoarthritis with hereditary progressive ophthalmopathy or Stickler syndrome. Joint Bone Spine 2011; 78(1): 45-9. Snead MP, Yates JR. Clinical and molecular genetics of Stickler syndrome. J Med Genet 1999; 36(5): 353–9. Van Camp G, Snoeckx RL, Hilgert N, van den Ende J, Fukuoka H, Wagatsuma M, et al. A new autosomal recessive form of Stickler syndrome is caused by a mutation in the COL9A1 gene. Am J Hum Genet. 2006; 79(3): 449–457. Baker S, Booth C, Fillman C, Shapiro M, Blair MP, Hyland JC, et al. A loss of function mutation in the COL9A2 gene causes autosomal recessive Stickler syndrome. Am J Med Genet A. 2011;155A(7):1668–1672.